I think we should ban the word, “affordable,” because it is subjective and meaningless without context. What is affordable to one person is not affordable to another, and affordability depends on individual persons’ incomes, assets, and spending habits as well as where they happen to live. Not to mention their priorities. We have affordable cars in this country, for example, everything from a used $1000 clunker, if not destroyed in the “cash for clunkers” program to a $250,000 Bentley or Rolls or even high end Mercedes. But of course they are not all the same. The same is true for restaurants, hotels, cell phones, televisions, shoes, jeans, and just about anything else a person might want to buy. Even houses! The need for “affordable housing” is often suggested. I believe the liberal viewpoint on housing is that every community should have, in all neighborhoods, low priced housing that low income folks can afford to buy or rent. Everybody recognizes that the size and quality and features of such “affordable housing” will differ significantly from that of higher priced housing. So, the obvious solution to both problems is to provide less health care at a lower cost and give everybody equal access to it, recognizing they may or may not choose to take advantage of it. We might refer to that approach as the USPS plan. Is that the desired goal? It’s not what I would recommend. I’d rather say that the goal is universally available, unconditional, competitively priced, major medical insurance that protects people from bankruptcy or significant loss of savings in case of large medical bills. Let those who need it and can afford it pay for that major medical insurance, just as they pay for their houses and cars. And let them pay for their own flu shots, birth control pills, annual check ups, and other routine health care expenses as well. For those in poverty and unable to pay, we can provide health care benefits with a program similar to the Food Stamp (SNAP) program. “Universal” health care is no more desirable than “universal” food stamps or “universal” toilet paper or “universal” housing. Many have been fooled or misled by the simple fact that I and my contemporaries on Medicare are currently enjoying an unprecedented and unsustainable benefit at the expense of the younger generations facing a major disappointment a few years down the road. Here is the simple fact: In 2014, Medicare spent $613.3B for about 50M beneficiaries, an average of about $12,000 each. 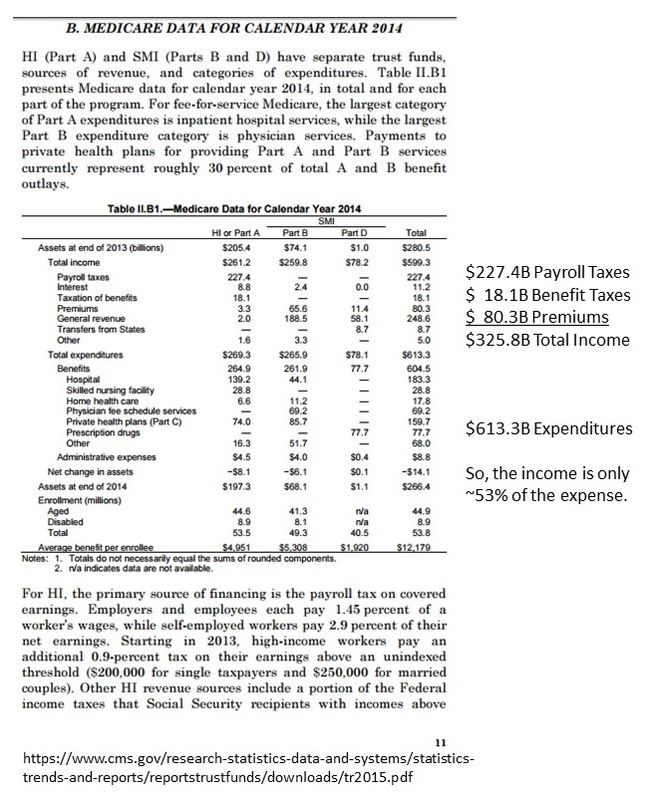 Medicare payroll taxes ($227B) plus Medicare premiums ($80B) plus taxes on benefits ($18B) paid only 53% of that expense. (The rest had to come from “general revenue.”) No wonder everybody thinks Medicare is such a great deal! Here are the data, directly from cms.gov. It is clear that the Medicare benefits currently being paid are not “affordable” and are crowding out other needed spending on such as infrastructure repairs and improvements. It is unfortunate that private insurers do not enjoy the freedom of such generous payouts since they must collect enough in premiums to pay the benefits and their expenses, including cost of capital, to stay in business. All the data are not in for 2015, but beneficiaries are up about 10% and expenses up about 6% over the 2014 totals. Those trends are expected to continue for the foreseeable future. Let me add that it is a bit difficult to tease out the details on medicare spending from my favorite source, the BEA NIPA tables. In those tables, Medicare and Social Security are lumped together and sometimes combined with other social spending. 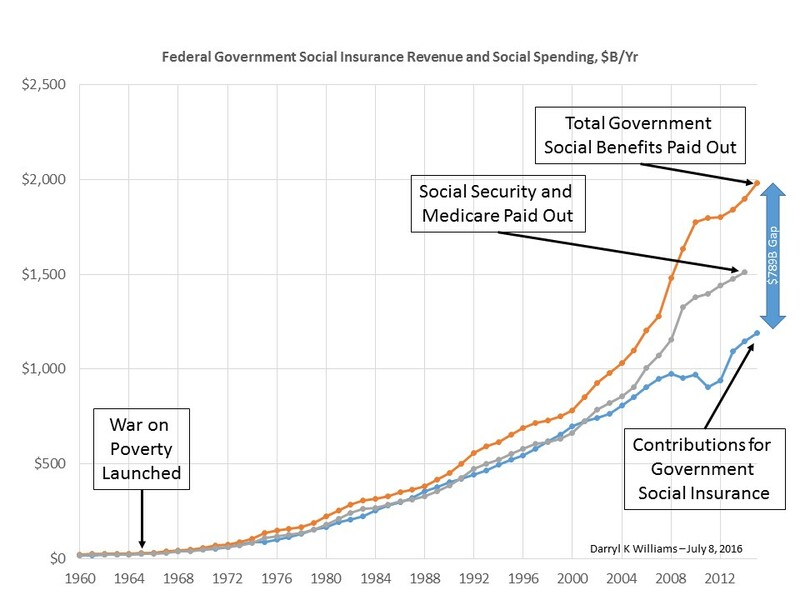 Here is a helpful chart from BEA NIPA giving a 55 year history of Contributions for Social Insurance, the lower line, Social Security and Medicare benefits, the center line, and total Federal Government Social Spending, the upper line. The ever increasing gap is now approaching $800B a year. As always a very pragmatic view of the facts and the problems that “wrong solutions” to our problems creates more significant long term problems. On a separate note I actually heard Mrs. Pelosi say on the house floor this AM that we need a root cause discussion and fix for the issue with the police shootings in Dallas last night. That is one thing that I learned from you….unless you get to the root causes…and there usually is more than one…compensating actions will not fix the problem. I am convinced that our elected politicians really don’t want root cause solutions as their own political agenda is more important than continual improvement..but maybe I am wrong. I really hope so.